One of the side projects at the Moscow Biennale of Contemporary Art was an exhibition called “InstaArt: Art through the filters of Instagram.” Fifteen hundred photographs were on display, showing how Russian bloggers see the world. These days, Instagram is available to almost everyone, including people who seem to be far from serious pursuits of photograph. Thus, taking part in this competition was very easy. According to the official #voxxter, over 6000 photos were posted. Out of these, the jury of professional photographers, art critics and art historians selected 1,500 of the best. For the eyes of visitors, unusual architectural monuments, well-caught everyday moments, bizarre landscapes and sightseeing landmarks were presented. Some photos were printed out, but the majority were shown as a slide show on plasma screens. Ten screens were dedicated to 10 nominations. Among the nominations were subjects like "people and people," "monuments," "architecture," "landscape," etc. The main category, according to a member of the jury, was "street art." “Those are photos of someone else’s art. Graffiti appears sometimes as contemporary art, sometimes as arts and crafts, sometimes as decorative appliances, and sometimes as hooliganism. Where the line between art and bullying is and how to take pictures of it—this is a question for the professionals,” said the jury member. Only Russian photographers were represented, but, through them, the whole world was captured: With the help of Instagram, almost every tourist becomes a photographer. Instagram in Russia is basically the same as in the rest of the world. Frames that were sent to the contest were put up showing not only authorship (there are no last and first names on photographers, but instead "nicknames" on social networks), but also the number of “likes” and commentaries. Some pictures have received two or three "likes," some managed 300–500, and only rarely did a frame gather tens of thousands of “likes.” For example, a picture of a beautiful girl holding a very complex athletic pose received 24,500 "hearts" from viewers; people enjoy the model’s athletic feat or, perhaps, her figure in a bathing suit. “The number of ‘likes’ does not necessarily mean that the picture is a work of art. We all frequently come across movies, music and photography; but not all of us are experts. ‘Likes’ only tell us about the popularity of the person: Barack Obama or Lady Gaga would get millions of ‘likes’ on any picture,” said Golovach. This is not the first time that Instagram has become the theme of an exhibition. Serge Golovach held his personal exhibition, “Like.Life,” in March 2013. Another member of the jury, Denis Abramov, has put on a display his own personal Instagram exhibition. 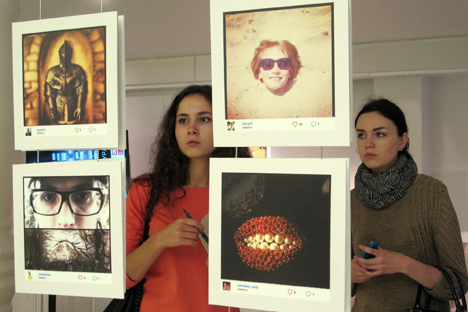 In addition, exhibitions of local bloggers were held in Krasnodar and in Chelyabinsk. Naturally, Russia is not a pioneer in this area: In 2011, these kinds of exhibitions were held in London, New York and Singapore. The “InstaArt” exhibition is open until Oct. 19.